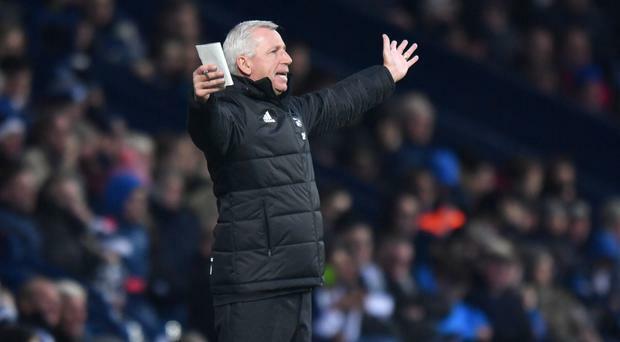 Alan Pardew's first game in charge of West Brom ended in frustration as they were held to a 0-0 draw by Crystal Palace. The stalemate extended Albion's winless run to 13 games and allowed Palace to climb off the bottom of the Premier League. Julian Speroni, a last-minute selection after Wayne Hennessey was injured in the warm up, denied Albion with saves from Jay Rodriguez and Hal Robson-Kanu as Pardew settled for a point against the club which axed him 12 months ago. Christian Benteke wasted Palace's best chance, with the Eagles having now gone 10 straight away league games without scoring. The point at least lifted Palace off the foot of the table but they remain in the relegation zone, three points and a place behind West Brom. Palace, who only named six substitutes, suffered an early blow with Hennessey's withdrawal. It meant the Eagles went into the game without a goalkeeper on the bench and Speroni was forced to focus during a bright start from Pardew's new side. Robson-Kanu directed a tricky chance over from eight yards before Salomon Rondon fired at Speroni and Rodriguez - in for the injured Matt Phillips in Pardew's only change - headed wide. Albion were on top and Martin Kelly widely diverted Robson-Kanu's drive over and, from the resulting corner, the unmarked Ahmed Hegazi headed wide. Zaha, who had already hit the side netting, then came close again when he robbed Gareth Barry only to see his 22nd minute strike deflect over. They were warning signs for the hosts as the game opened up and, s lowly, Albion's control waned once Barry was forced off injured after half an hour. Without the midfielder, the hosts lost their footing as Palace grew into the game and Benteke should have put the Eagles ahead before half time. First, he was thwarted by Foster after a clever run and, three minutes before the break, he planted a free header straight at the goalkeeper. But Albion regained their composure after the re-start and it was Speroni in action when he denied Rodriguez after the striker tricked his way into the area. Joel Ward twice denied Sam Field with crucial blocks and Speroni saved well from Robson-Kanu on the hour. Palace's threat disappeared during the second half with the Baggies holding a degree of control but a goal never came. Rondon headed wide with eight minutes remaining and the visitors survived some late pinball in the area to take a point.